All Aircraft exceed government standards and regulations and our pilots and crew are happy to meet and discuss any concerns or questions that the client may have before a flight. Our standard is to have two pilots available for each flight crew. All documents pertaining to the safety records of pilots are available as well as their personal references. One of our goals is to make your experience as free from worry and concern as it possibly can be, and open communication and trust are important to facilitate these relationships. 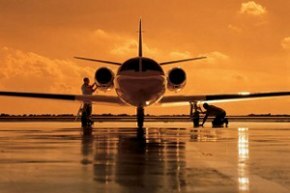 All of our private aircraft are rated ARG/US and/or Wyvern-compliant, always meeting and exceeding the industry's highest standards. The Wyvern Standard has been set by the Wyvern Customer Advisory Board; whose standards greatly exceed minimum government standards for certified aircraft for hire. Their reputation for safety is impeccable. With at least $350,000,000 of insurance covering each aircraft, security and peace of mind is another feature we offer. We can also offer and needed security for concerns ranging from valuable cargo to Dignitaries and VIP’s; including armed escorts and courier services if needed. Trust us to get you and your valuables to your destination, safely and comfortably. Our standards and practices are far more impressive than any commercial airline and with such attention to detail, from training to maintenance, we are sure to be the safe solution to any of your flying needs. Find out how we can help you charter the perfect flight with our world-class services. Please feel free to let us know if you have any questions about the services that we offer. Copyright © 2019, WAP Air Charter Inc.